LAUSANNE, Switzerland — The World Baseball Softball Confederation (WBSC), the world governing body for the sports, unveiled the team rosters for the Europe versus top ranked Japan two-game baseball series scheduled for 10-11 March at the Tokyo Dome. WBSC also announced on Tuesday that sportswear brand Asics has become the official apparel sponsor of the newly established “Europe” men’s baseball team. Under the sponsorship agreement, Asics, a leading sports performance brand, will outfit Europe with a complete set of official competition apparel, including uniforms (home and visitors), hats, shoes, belts, jackets, undershirts and pullovers — and training suits and running shoes for the team’s historic debut versus Samurai Japan. As baseball/softball’s popularity steadily increases in Europe, WBSC announced plans two weeks ago to summon the first-ever united European baseball team to provide an additional platform with which to raise the profile and showcase the brand of baseball in Europe. The official look and apparel design for the Asics-backed Europe team will be unveiled next month in Tokyo. Nineteen of Japan’s 26 players were on the roster for the Japan vs. MLB best-of-five series last November, won by hosts Japan. The 2011 World Champions, Netherlands, take the honour of having the most players selected (15) to represent Europe, including 10-time Major League Baseball Gold Glove winner Andruw Jones, who played the past two seasons with NPB’s Tohoku Rakuten Golden Eagles and played for the Netherlands in the 2013 World Baseball Classic. Italy will have six players heading to Tokyo to represent Europe, including NPB’s Orix Buffaloes pitcher, Alessandro Maestri, while Spain (4), Germany (2) and France (1) will also have a presence for Europe. WBSC also revealed that umpires from the Chinese Professional Baseball League (CPBL) — a WBSC Associate Member — will officiate and oversee the two-game series to ensure neutrality, highlighting the WBSC Family’s shared vision to grow the sport globally and safeguard the integrity of the game. NPB — the second highest-attended major sports league in the world in 2014 (approx. 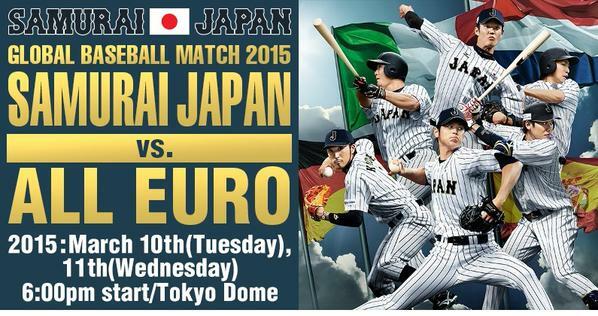 23 million) and also a WBSC Associate Member — is the host of the Europe versus Japan two-game series.